All the most current Brazilian banknotes (paper money / currency) and coins in circulation are displayed below. While older coin designs remain in circulation, they are not displayed here. New banknote designs (announced in February, 2010) are also displayed here. For the latest, up to the minute exchange rate for the real to/from US dollars, euros, British pounds, Japanese yen and numerous other currencies, visit the free online Currency Converter. For even more financial related information, also see Brazilian currency and Brazilian banking and banks. You may download a zip file containing all the banknotes and coins (with front and obverse sides) displayed here below. Caution! Especially when dealing with money, keep in mind that, in Brazil, the use of commas (,) and periods (.) expressed in numerals is exactly the opposite of what is used in the United States. Brazilians use a period (.) instead of a comma (,) —to delineate thousands— and a comma (,) instead of a period (.) —to delineate fractions. Normally, an amount in reais is written as R$, consequently, R$ 6,00 (with a comma) is six reais and R$ 6.000 (with a period) is six thousand reais. Likewise, for amounts with fractions (centavos), it's 1.045,25 instead of 1,045.25 (one thousand, forty five reais and twenty five centavos) or R$ 10,25 instead of R$ 10.25 (ten reais and twenty five centavos). The female effigy on the face of all Brazilian banknotes is a representation of a young woman wearing a crown of bay leaves. Down through history, this effigy has often been used in allegoric paintings and sculptures displayed in government buildings throughout Brazil as well as being used on Brazilian coins and banknotes. It was first used as a pro-Republican icon in the 19th century and was inspired by France's Marianne. After the proclamation of the Republic in 1889, it became an important symbol of the newly formed Brazilian Republic. 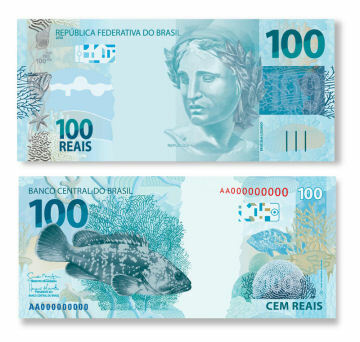 In February, 2010, the Central Bank of Brazil announced that an entirely new series of banknotes would be issued starting in 2010. 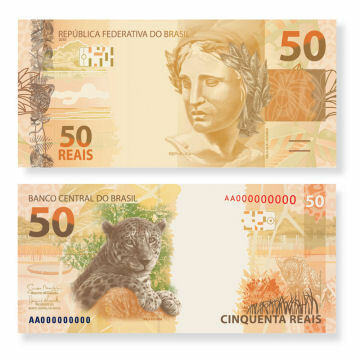 The new banknotes started being issued in December, 2010 with the release of the new R$50 and the new R$100 banknotes. Issuance of all other denominations will be gradually completed by 2012. The new banknotes are the first design change since the real was adopted in 1994 and provide better anti-counterfeiting protection. All older banknotes will be valid and honored as long as they remain in circulation. Copyright ©2010 Brazil Consulting. All rights reserved.